Mobsters and Martin Scorsese go together like cake and ice cream, chips and dips, Donald Trump and egomania. So the maestro behind Goodfellas, Mean Streets, Casino, Gangs of New York and Boardwalk Empire invests HBO’s Vinyl with a strong gangster vibe during the course of recreating New York City’s raucous, drug-and-booze-powered 1970s music scene. It’s an industry where hit records aren’t the only hits. And where payoffs, coverups, stealing and dirty dealing are business norms. Scorsese and principal co-executive producer Mick Jagger for the most part get away with all of this sound and fury, even though some of Vinyl’s excesses are more over the top than Liberace’s closet. He’s yet to be seen in the five episodes made available for review, including Sunday’s extended two-hour pilot. But a mockup of Robert Goulet makes the scene in Episode 4, recording a take-the-money-and-run Christmas album for Richie Finestra’s (Bobby Cannavale) cash-strapped American Century Records. Season One will have 10 episodes. 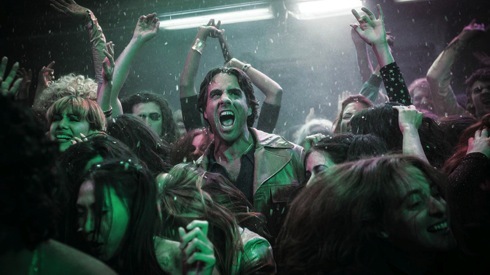 First seen sweating, drinking and on the prowl for a cocaine fix, Cannavale gives a consistently manic performance as the high-strung, profane founder of a company that’s been running out of cachet and bankable artists. But in terms of loathsome, self-indulgent decadence, he gives way to Andrew Dice Clay’s opening night guest role as super-crooked radio station magnate Frank “Buck” Rogers. Bloated and bearded, Dice Clay throws himself into this part with an animalistic vengeance that’s both wondrous and shocking to behold. Those on the receiving end of his dipped-in-dung tirades include poor Donny Osmond, who’s out of earshot and shown only on his latest album cover. Will Emmy voters dare reward the Diceman with a nomination? If he knows where they live, they’d better. After showing Cannavale’s Richie in full-blown, back-off-the-wagon mode, Episode 1 flashes back five days to the planned sale of American Century to German investors. Viewers also get a big dose of early narration, with Richie citing his humble beginnings: “You think you work hard? Try scraping Chubby Checker’s vomit off the inside of a toilet stall.” Gotcha. Richie’s lieutenants include Ray Romano as promotions head Zak Yankovich and Max Casella (from Doogie Howser, M.D. to Boardwalk Empire) as A&R (Artists & Repertoire) head Julius “Julie” Silver. Along with three other associates, this male quintet at times is too comical to be believable within a drama whose cutthroat ways and means might make one wonder why Richie would ever hire these stooges in the first place. The again, Tony Soprano had his Bada Bing crew, all of whom had goofball tendencies. Faring better on the stable-headed front is Juno Temple as Jamie Vine, an office assistant who supplies sandwiches and drugs to both staffers and company clients. But she yearns to discover a band of her own, and finds one in the very rough hewn Nasty Bits. The lead singer, brusque Kip Stevens, is effectively played by Mick’s son, James Jagger. Vinyl goes cartwheeling over the top at times, never more so than in the fantastical close to Episode 1. This is where Richie has his epiphany about re-inventing American Century as a home for uncompromising music that cuts through the crap. Well, to a point. The label still can’t bring itself to cut loose the money-making Goulet. There’s also the matter of a messy coverup of a very violent act in which Richie takes part. Fox’s Empire got to this plot line first, with record company magnate Lucious Lyon (Terrence Howard) lying about his role in a capital crime he committed. Vinyl can’t help but seemed warmed over in this respect. But Scorsese and lethal mayhem pretty much go hand in hand -- in this case, needlessly. Our “hero” already has more than enough trouble on his hands. Vinyl’s other principal character is Richie’s wife, Devon (Olivia Wilde), whom he first met during her time as part of Andy Warhol’s entourage. The series regularly flashes back to those earlier days, with Warhol (John Cameron Mitchell) portrayed as quietly protective and even semi-sweet. Episode 3 has a beautifully affecting “current-day” scene between the two of them. The series also weaves other real-life characters into the mix, most notably Alice Cooper (Dustin Ingram) in Episode 3. There are mockups as well, including Daniel J. Watts in an increasingly key role as a soul/funk band lead singer named Hannibal -- a k a Sly Stone of Sly and the Family Stone. Vinyl’s music is uniformly terrific, unless it’s Goulet’s intendedly ridiculous rendition of “Christmas You Go Too Fast.” Stand-alone performances often are used as bridges between scene changes. Although the artists aren’t identified, you’ll recognize the sounds and send-ups of Janis Joplin, Otis Redding and many others. Music from Vinyl will be released weekly after an 18-track Volume One is “dropped” two days before the Feb. 14th premiere. It’s all very, very ambitious, with hits that keep on coming while storyline misses seem to be almost beside the point. Vinyl is thoroughly rousing at its core, a crazed, dope-filled, sometimes dopey trip that begins in 1973 and has nothing in common with the earlier, comparatively sedate decade brought to you by AMC’s Mad Men.